US forces have targeted a radical Islamic group alleged to have links to the al-Qaeda movement in a Kurdish-controlled area of northern Iraq, eyewitness say. About 70 US missiles are reported to have struck the belt of hill country close to the Iranian border that is controlled by the Ansar al-Islam. Both the US administration and the Kurds accuse the movement of being linked to Osama Bin Laden's al-Qaeda network. Ansar commanders deny this - and accusations that they have links with the Baghdad government. BBC correspondent Jim Muir says that the strikes were the start of a campaign expected to involve further missile and perhaps air strikes by the US. This could followed by a ground assault carried out by the Kurdish faction which controls the surrounding area, the Patriotic Union of Kurdistan, and by US special forces, our correspondent says. Ansar al-Islam preaches a radical interpretation of Islam and holy war and controls about a dozen villages and a range of peaks between Kurdish-held territory and the Iranian border. The group formed in December 2001 after a merger between Jund al-Islam (Soldiers of Islam), led by Abu Abdallah al-Shafi'i, and an Islamic Movement in Kurdistan (IMK) splinter group led by Mullah Krekar. On Friday, Mullah Krekar, alleged leader of Ansar al-Islam, was charged in Norway, where he has lived since 1991, with planning terror attacks. Earlier this month, US Secretary of State Colin Powell told the UN Security Council that Ansar al-Islam had given safe haven to al-Qaeda members, including a senior Baghdad agent, and may have tried to make chemical weapons. 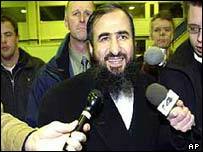 However Mullah Krekar has denied any links with either al-Qaeda or Saddam Hussein's regime in Baghdad. Did Blair risk all over Iraq?